The Bose® brand has long been synonymous with innovation. Every one of its speaker systems is as surprising as it is impressive. Bose systems are continually evolving and the company is always at the forefront of the latest trends. As wireless music systems continue to grow in popularity, Bose continues its tradition of releasing Internet-connected audio systems that offer a keen balance of sound quality, innovation, and ease of use—all without requiring you to tether wired music sources like the traditional audio systems of yesteryear or last month. Like an increasing number of music systems, Bose SoundTouch™ models offer wireless audio streaming that uses Wi-Fi technology. This means that once the speaker is connected to your home’s wireless network, you can enjoy your favorite music without having to connect an audio source like your smartphone, tablet, or laptop. However, not all systems employ the same intuitive approach as the Bose SoundTouch lineup. As its name implies, with the touch of a single button, you can stream Internet radio, Pandora, your entire digital music library, and any other online music source to which you have access via Wi-Fi. If you have a Wi-Fi network currently set up at your house or apartment, any SoundTouch speaker model can integrate quickly and seamlessly into your network. Bluetooth isn’t a bad thing, however, and if you prefer to use it, Bluetooth is also built into Bose’s SoundTouch systems. All of the SoundTouch systems are designed with Internet radio and other online music services built right into them, which means that as long as your SoundTouch speaker is connected to a Wi-Fi source, you don’t need an external audio device like a smartphone or tablet to play music through the speaker. Basically, you don’t need to rely on any other audio device to stream music from your favorite online or home network sources. All you need besides the SoundTouch speaker and a Wi-Fi network is the Bose SoundTouch companion app. The free SoundTouch app is also available for iOS and Android smart devices, as well as Windows and Mac computer systems. It’s highlighted by six personal preset slots that are mirrored with six preset buttons on the physical SoundTouch speaker unit. All three SoundTouch models and their included remote controls are equipped with these six preset button options. After you’ve used the SoundTouch app on your mobile device to set the six preset slots with your favorite six music choices, you can use the six preset buttons on the speaker or included remote control to select those saved presets from the app. Thankfully, the app is designed to be incredibly easy to use. All you have to do is slide the audio source you’re listening to into one of the preset slots on the screen and it’ll be saved for you. For instance, you can fill the first preset slot with your favorite band or artist in your personal digital music library. Maybe for the second preset, you can slide the name of your favorite online radio station into its preset slot. 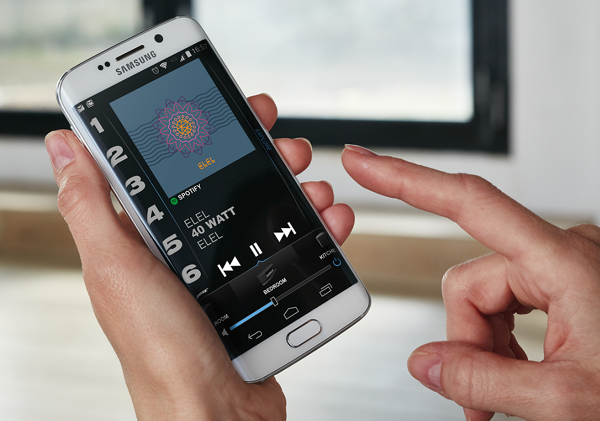 Do you want Pandora or Spotify in the third slot? You got it, simply drag it over. All six presets can be filled in this way. Any home network or online music source or station can be locked in as a preset. Once you’ve set all your favorite Internet stations or online/personal sources, you can enjoy them through any of your network-connected SoundTouch models without using external audio sources. Just use the SoundTouch remote or walk up to your SoundTouch speaker, select one of the six presets and start jamming with your favorite music—even if your laptop, smartphone, tablet, MP3 player, and every other Wi-Fi-enabled audio device in your house is unplugged, in the car, or the battery is dead. You can also use the SoundTouch app for even greater control, such as when you want to stream a song or station that you haven’t added as a preset. The other advantage of owning any of the SoundTouch speakers is that when you are ready, you can add more SoundTouch models in other rooms around your home for a seamless multi-room music experience. You can purchase and control up to four different SoundTouch devices via Wi-Fi. After you connect the four wirelessly, you can continue to add many more SoundTouch speakers as long as you connect them via Ethernet cable instead of Wi-Fi. If you do it this way, you can connect an infinite number of SoundTouch speaker models. For simplicity’s sake, let’s say you have two and then you add two more models. All four can connect to your home network via Wi-Fi. Once all are connected, you can either play the same music through all four speakers throughout your home or you can listen to a different music source, station or preset in two, three, or four different rooms. Basically, as your home and music desires grow and expand, the SoundTouch line can grow at your pace, so you and your family will be able to stream and enjoy all the music you all love where you want in your home—together or independently—at the touch of button. The current SoundTouch line of compact speaker units includes three different models that are available separately, but also work together to offer a wireless audio solution for your entire home. The smallest of the three SoundTouch speakers is the SoundTouch 10. The line also includes the mid-sized SoundTouch 20 Series III and the SoundTouch 30 Series III, which is the largest of three Wi-Fi-enabled SoundTouch speaker options. All three models allow you to stream music via Wi-Fi from anywhere in and around your home. Since they all work together seamlessly, you can link them together wirelessly and build a multi-room audio system that can be easily and entirely controlled from your iOS or Android mobile device with the free Bose SoundTouch app. The compact SoundTouch 10 is small enough to go with you from room to room while still producing clear, room-filling sound. It features four LED connectivity indicators so you can easily determine the system’s status. The other SoundTouch options include the mid-sized SoundTouch 20 Series II and the SoundTouch 30 Series III, which is the largest of three Wi-Fi-enabled SoundTouch speaker options and is designed to accommodate larger listening environments. Each model incorporates the aforementioned six audio presets, but Ethernet connectivity is limited to the large SoundTouch 20 and 30 systems. If you have any wired audio sources, you’ll be happy to hear that all three SoundTouch models are generously equipped with 3.5mm audio inputs. The 20 and 30 also feature 1.6-inch OLED panels that show the current station, preset, or song title of the track to which you’re listening. Whether you want to use a single SoundTouch speaker system in one room or you want to fill your entire home with SoundTouch speaker systems, Bose makes it easy to control and hook up as many systems as you need. With so many audio sources available via the Internet, Bluetooth, and wired, these SoundTouch Systems from Bose aim to be your one-stop music hub. The easiest (tedious and time consuming) remedy would be to "burn" all your CD's to your computer and or store them to a NAS drive, which you should then be able to access from your iTunes library or Windows Media player via the BOSE SoundTouch app. In the SoundTouch app, select the Menu icon (≡) in the top left corner and then select "Add Service"
Note: Only one library is allowed per computer. If a library already exists for a computer from which you are trying to create a new library, select that computer's existing library and choose "REMOVE MUSIC LIBRARY" so the new library can be added. Enter a name for the library and select "ADD MUSIC LIBRARY"
The library will now be available in the SoundTouch app by navigating to Menu (≡) > Music Library. If you're using an iTunes or Windows Media Player library, enable sharing of the library. Open iTunes > Edit > Preferences > Sharing. Be sure "Share my library on my local network" is checked. Then, check either "Share entire library"
Open Windows Media Player > Stream. Select "Allow remote control of my player"
Open Windows Media Player > Stream. Select "Automatically allow devices to play my media"
Text the word BOSE to be assisted by a customer service representative. I have recently acquired a bose soundtouch series iv and two soundtouch 10 speakers. I have a large odd shaped living room so I wanted sound from various angles. I grouped together the speakers and the series iv and it works fine if I'm streaming from my computer, but I can't get the two speakers to work if I am playing a cd on the series iv. This effectively makes my large cd collection useless. Can you help? I have a soundtouch series iv. I love it & had no problems with it. But recently, I had to wipe out most of the apps from my computer, due to a virus. I reinstalled the soundtouch app & set my speaker up, just like it was new. It will not show my windows media player music library. I have tried EVERYTHING. When I try to pair my Note 5 to the speaker, it pairs, but then says "Stopped or Paused". It HAS added my music library, but says there are no songs in that library. HEEEEElP!!! If you are trying to play a music library through the SoundTouch app, it should already support nearly any WMA format music (with the exception of WMA Lossless). You can see the official list of compatible file formats here. If you are trying to play these files from a CD in the disc drive of a Wave Music System product, then this will not be possible. Only uncompressed audio or mp3 files can be read directly from a CD. If your product supports SoundTouch, we would advice importing the CD to Windows Media Player on your computer and streaming it that way. I have a SoundTouch 20 and 30 and I can't get them connect via the Sound Touch app - the app shows an error message every time I try to pair either speaker with my app. I have tried on a laptop and an iPad. I have a sound 20 and 30, but can’t get them to play together via Bluetooth. Is this possible as I was told when purchased that I could. How can I play the same streamed music or cd on both my sound touch IV and my SoundTouch 10 so I can have the Sam music in multiple rooms? You can make this happen by using the BOSE SoundTouch app from your smartphone, tablet, or computer. Use the AUX input on the SoundTouch 10 if you have an AUX output on the LG soundbar. I have one SoundTouch 30 and two SoundTouch 10 speakers. I'd like to play the same music on my outdoor deck. 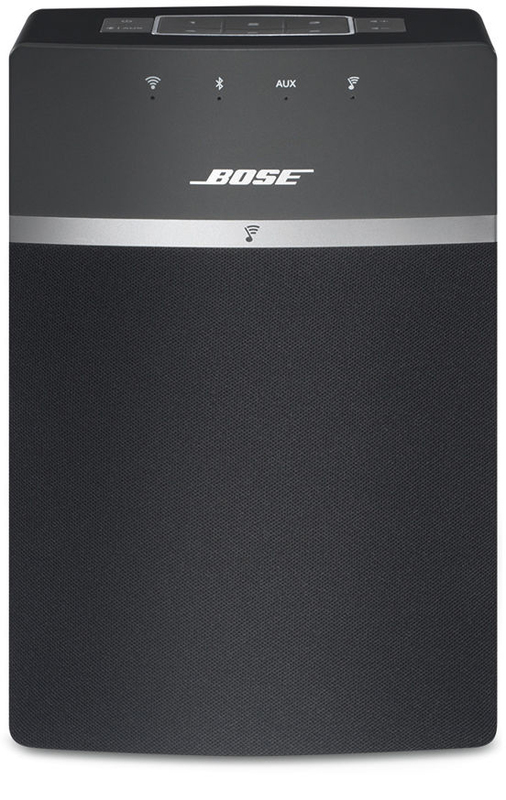 What Bose outdoor speakers are compatible with the SoundTouch speakers/SoundTouch app I currently have? Turn your existing speakers into smart speakers with the SoundTouch SA-5 Amplifier from Bose This amplifier can deliver up to 100W per channel and can accommodate up to 4 speakers. The SoundTouch SA-5 amplifier features Wi-Fi and Ethernet interfaces for high-speed Internet connectivity. Using the free SoundTouch app for Android, iOS, and Kindle Fire devices, you can wirelessly stream locally stored content and Internet radio services such as Pandora, Deezer, iHeartRadio, Spotify, iTunes, and Internet radio. Integrated Bluetooth connectivity allows you to pair and wirelessly stream music from similarly equipped devices. 3.5mm and dual stereo inputs are also on-board for interfacing wired music sources. The Bose 151 SE Environmental Speakers environmental speakers deliver full, rich sound for your listening pleasure on the deck, by the pool or on the porch. Built to withstand the elements, these award-winning speakers provide reliable, year-round performance that will have you humming in the sun or singing in the rain. If I want to control my bose speakers through a desktop computer rather than a mobile phone or tablet can I do this? This is for use in a reception area where desktops only and different receptionists working different hours. Looking to set up a music system that can work with a desktop computer. 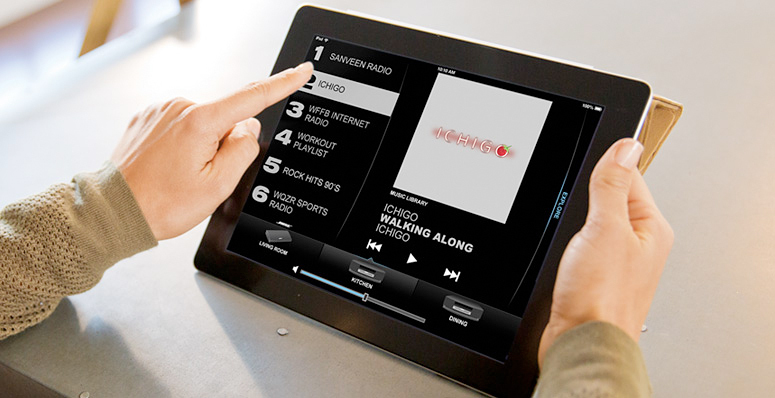 The SoundTouch® app lets you control your Bose® SoundTouch® system from your smartphone, tablet or computer. Use the app to explore Internet radio, music services or your music library. Start streaming music instantly, or use the app to easily personalize your system's presets to your favorite music content. Just download and set up the app on your device of choice, and let your musical discoveries begin. Can I used my Soundtouch 20 series to my car ? If ever it is possible, my problem is the cable for the power but the 9V of the car power is sufficient to supply the soundtouch ? This device is not designed to be powered by the 12 DC power from an automobile. Hi, just bought a sound link revolve+ is it possible to connect to a sound touch wireless link..? Not necessary. The Bose SoundLink Revolve+ already employs Bluetooth connectivity for streaming music from your bluetooth streaming audio products. Just added SoundTouch 10 to a ST 20. Seems the ST 10 has adopted the same preset stations. Can I have different preset stations for each unit? My wife has her desired stations which are different than mine. 6 preset stations are not enough between us, 6 is barely enough for me. Can use the sondtouch 30 III instead of the wireless speakers and if I get another 30 III can use that as a LEFT and RIGHT channel. Will the soundbar system be looked at as four seperate WIFI speakers or ONE can I control them independently also say pla music on on and tv on the soundbar. I have seen (and heard) the SoundTouch 30 Series III demonstrated with SoundTouch speakers using the SoundTouch app. 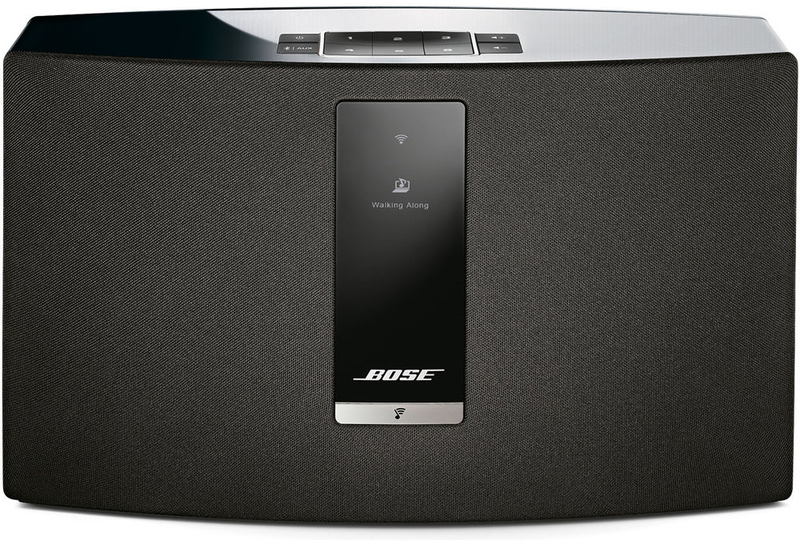 I have just bought a Bose soundtouch 30 for the living room and an bose 10 for the bedroom: amazing sound! But I've added the two speakers to the app and now I don't know how to play/select them independently. Can't find the info anywhere. The app suggests I remove a speaker, which I haven't tried as it implies I'd have to go throught the whole rigmarole to set it up again, and we got fed up with that when we were setting them up in the first place. Detailed instructions seem to be lacking somewhat. Can anyone help? In the SoundTouch app, both devices should appear on screen, one atop the other, if music is playing and both devices are powered on. You may have to scroll down just a bit to see the seconsd device. Each device may be controlled independently and simultaneously while they are playing. Mute either or both devices by tapping the speaker icon on the left-hand side of the screen. Remember to select “PLAY ALL” from the menu, pick your rooms for music, then enjoy independent control of each system. I've been enjoying a SoundTouch 20 for a couple years and was wondering what my options are for extending that to my deck outside. Do you have any suggestions? Can you not stream via wifi from IPhone or iTunes? Does it have to be Bluetooth? I bought this because of wifi streaming (not just radio and spoify) so may return it if I can't stream via wifi. This is for a soundtouch 30 by the way! I just recently bought a Bose SoundTouch 10, I previosly used sonos, but I got tired of not having a bluetooth option as well. But there's something I'm missing from sonos that I don't seem to find with the SoundTouch App in my iPhone 7, I used to have the sonos controllers while my iPhone was locked in the Control Center of iPhone. Could you tell me if it's possible to make the SounTouch controllers visible there? I have a couple of SoundTouch 20's. One newer and one older model. The audio from the same preset internet stations when played, is not in sync with each other. It's not terrible but noticable. I think audio played through the app installed on a computer results in the same. How do I sync them completely? Make sure your original SoundTouch 20 (and the newer one as well) has been updated with the lates software as well as your SoundTouch app on your computer/smartdevice. I have a Bose Cina mate !! system and am wondering if I can buy a soundbar and adapter for the CineMate that will connect the two together wirelessly ? I have set up wifi and can play the radio through my Bose 20 sound touch. However I'm struggling to run pandora or Spotify. Do I need an activation close for Pandora? I have the Soundtouch model 20. I can't play repetitive songs, only one at the time. Can you please help me? Thank you. I recently purchased a soundtouch20 and paired it with an Echo dot. It works perfectly. 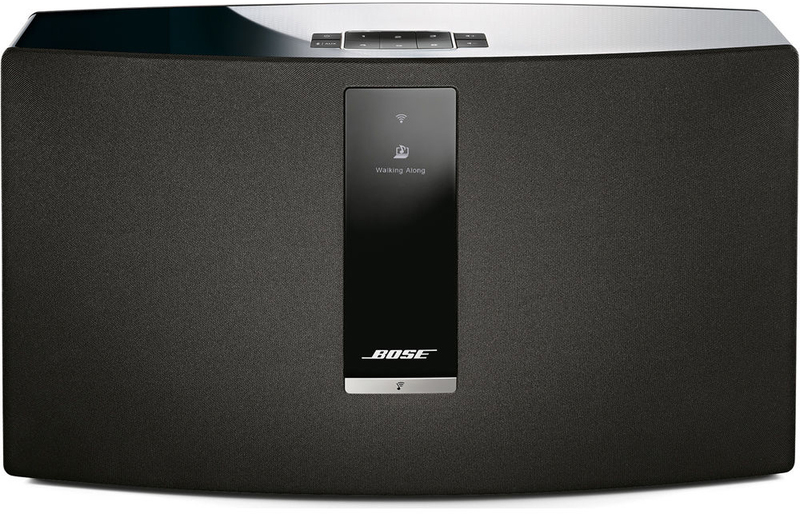 I would like to expand the system by grouping my soundtouch 20 with my Bose soundling portable speaker Is it possible? If so, any suggestions on set up? You should have no problem adding more Soundtouch speakers to your existing SoundTouch 20 system. Hi. I have soundtouch 520 in my living room and two soundtouch 10 in my deck. Can i play the same music in the same time using all of them? No problem at all. Wirelessly stream millions of songs through Spotify, Pandora, iHeartRadio and Deezer, Internet radio stations, and your own music library. The free SoundTouch app lets you control your music from your smartphone or tablet. The app is available for Bluetooth-enabled iOS and Android devices. Six programmable presets let you play your favorite music from the app or the included universal RF remote. Additionally, the SoundTouch 520 works with other SoundTouch systems to create a multi-room listening experience. Download the BOSE SoundTouch app to your computer and/or mobile device and purchase one or more BOSE SoundTouch speakers. I have 8 year old "Bose Companion 3, series 2" speakers that gets input from computer and or phone and works great. I want to add wireless speakers for other rooms and am thinking about a pair of soundtouch 10s. How to do it? A) Can I simply get an auxilery splitter and plug it into one of the soundtouches and have it use wifi to the other soundtouch 10. C) otheway to get signal to both the new wireless speakers and the old fixed line? many thanks, urgent as 18 year olds birthday bash is looming! You will need a Wi-Fi wireless router and internet service. The SoundTouch speakers connect wirelessly to your network without audio cables of any kind. Hi I've set up my speakers but don't seem to be able to play my music from my I-phone through my speaker please help. How do I play Apple Music collections off of my iPhone onto the boss SoundTouch 30 model? *Note: Files purchased from iTunes may be “protected” AAC files that are locked by Apple’s proprietary DRM. These files will only in the SoundTouch® app by converting the files to remove protection. You can tell if your files are protected in iTunes by checking if they show "protected AAC" under the "Type" column in iTunes. Select these files, right-click them and have iTunes convert them so that they are available via SoundTouch®. HI, I am unable to convert any of my library files, thus none of the songs in my library can be streamed via the soundtouch app. Any solution? If I connect an audio device (such as a turntable) to the aux input, will it then play through all the connected speakers? Yes it will. Make sure yout TT has a built-in preamp that allows switching its output to a LINE level for compatability with your BOSE component's AUX input.